This new listing is likely to sell quickly. Why? Five major reasons. First, here’s a brief description of this new listing: Gorgeous country home at end of road and nothing but trees and mountains beyond the house on all sides with a stunning view of Hurricane Ridge. Everything you need is on the main floor with a huge open floor plan and lots of mountain views, hardwood flooring, a wood stove, and an efficient heat pump with forced air electric. Outbuildings for wood storage and a garage/shop or woodshop, plus an attached carport on the house. Extra large bedrooms upstairs and a game room or office/den downstairs. 1.) The inventory for homes like this is about zero. Many retirees have sold their homes in California or Colorado or Texas or Florida, and they are on the hunt for a home in the Sequim and Port Angeles area. As several have said to me, “We need to find a home or we’ll be homeless.” The inventory for nice homes like this is extremely low, like non-existent. Even in a small market like this, on any day of the week, we must have two dozen buyers filtering through the online MLS to find their home, so a new listing is viewed by qualified buyers the first day it appears on the market. 2.) It’s very hard to find the ideal location with a view. Everyone knows that location is everything in real estate, and who doesn’t want a beautiful location with some kind of mountain view or water view, or at least a valley view with fields and grazing animals? 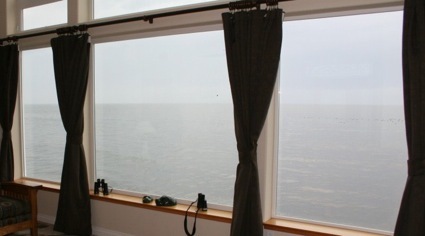 A new listing, like this one, with an incredible view from the windows is going to get a lot of attention immediately. 3.) A traditional floor plan with 3 bedrooms and 2 baths and 1,800 sq.ft. plus is also hard to find now. In many markets, this kind of traditional open floor plan with a modern kitchen is not hard to find, but it certainly is in this market between $450,000 and $650,000. 4.) A nice neighborhood where the lots are large enough to provide some measure of privacy and room for gardens is in high demand. People generally don’t move to the Northwest to the gorgeous Olympic Peninsula to live on a postage sized lot in a subdivision with houses 15 feet apart where you look out your kitchen window only to see your neighbor (not wearing dentures) in a white T-shirt waiving from her own kitchen window. A new listing that meets these criteria is likely to get a lot of attention, and if it is priced right, it is likely to get a full price offer right away. The link for the 3D Interactive Virtual Tour is on this image. You can use your computer mouse (or arrows) to walk through the home and get a very realistic feel for what it would be like to walk through this home yourself. 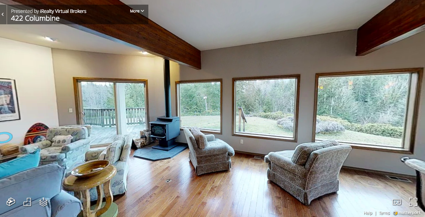 Buyers love these interactive 3D tours, because you’ll know right away if this is a home you need to walk through. You won’t find another home like this on the market. You can view this home in person by texting or calling Chuck Marunde at 360-775-5424. You can see the full online MLS data sheet at New Listing. Not to put any pressure on you, but I wouldn’t wait too long. I could be wrong, but I think this new listing will sell fairly quickly. Buying an older home could be a great idea, especially an older home that was built well and retained its classic architecture. Or you might love an older home that was remodeled and is practically like a brand new home. An older home might be especially appealing because of it’s ideal location and water view or mountain view. But buying an older home does have its own unique challenges, and that’s what this article is about. This is a true story. I represented the buyers on this older home, which was built in 1924 and completely remodeled recently and listed for sale. The owner did a wonderful job remodeling, and the home itself was clearly well built in 1924. It is not only structurally sound, it has no indications of any serious problems with the basement or the foundation or the walls or attic. In the Port Angeles area, houses built in the early 1900s were largely built with locally milled timber, and they were using good hardwood and large beams. So buying this older home made sense because it had such good bones. Here’s where it got challenging. The home inspector found a long list of items that you would not expect to find in a home that is a total remodel. It appeared to be practically a brand new home. Three windows were defective, although they had been installed as new windows in the remodel. A contractor had started to replace insulation in the crawl space, but didn’t complete the job and left a pile of old insulation in the crawl space. A massive hornets nest was hanging in the crawl space, and while it appeared to be vacant, you would expect that it would have been removed. The attic had the old “vermiculate” insulation from 1924, but that is now recognized as being a potential health hazard, like asbestos. The current owner who did the remodel did not recognize this, and honestly, most people would not, but the home inspector did not miss it. Where new roof gutters had been installed on the outside of the house, a large hole was not plugged, which would allow birds access to the attic. And there were a number of other small items, but they were items that you would not expect to have to repair if you are buying a home that was “completely remodeled.” How did the owner or contractors miss these dozen or so repairs? I think the simple answer is that many of these were started but not completed. Have you ever known someone who is good at starting projects but has trouble finishing them well? A lot of people have trouble finishing something they start, and a lot of people take short cuts or don’t care about doing the best work that they can do. So how did we handle this? 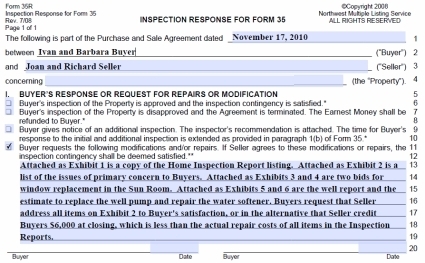 The buyer asked me to use the Form 35R (the home inspection response form) to ask the seller to repair most of the items. There was a lot of negotiating and going back and forth. It got a bit contentious when the seller’s glass vendor claimed two of the windows were not defective, although they clearly were. The home inspector stated they were defective and another glass company said they were obviously defective. They came defective from the factory with problems between the glass panes. My buyer insisted they be replaced or that she receive a credit for their replacement. Ultimately, we got through all the repairs, and the seller and the listing agent are to be commended for working with me through all these issues over a period of weeks and being nice and professional. Things could have gotten dicy and were it not for the seller’s willingness to work with us, the transaction might have died. Frankly, many of the issues were we dealing with are unique to an older home. There wasn’t really any way to proactively head off these issues, but it is important to know how to work through them intelligently and diplomatically. This gorgeous little home just closed a few days ago, and my buyers are so happy! I’m happy for them, especially because Thanksgiving is in two days, and they can celebrate in their new home. Buying an older home can have its own unique challenges. How Much Due Diligence Can I Do Before I Submit An Offer? A beautiful home just came on the market, and it’s halfway between Sequim and Port Angeles, but still in the Sequim school district. This home has a Port Angeles address, but it is much closer to Sequim. It is 11 minutes from Costco in Sequim (6.8 miles), but it is 16 minutes from Safeway in downtown Port Angeles (9.3 miles). 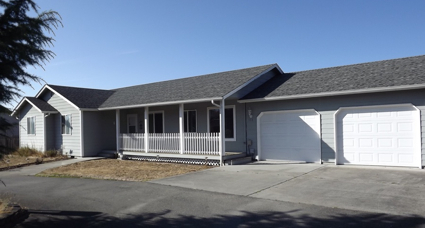 This beautiful home is what so many retirees are looking for right now, and because of the low inventory in the Sequim MLS, it is hard to find a home like this. Here’s the MLS description of this home: “Overlooking lush green fields with a water view on the horizon and located halfway between Sequim and Port Angeles, this is the ideal open floor plan, the perfect modern kitchen, and everything is on the main ground floor. The yard is low maintenance and the garage has a work bench. The laundry room is off the kitchen for convenience. There’s a deck with a stunning view of the fields and Strait where you can grill your steaks and relax on your own little piece of Heaven.” This really is a beautiful home. Call or email me to see this home. 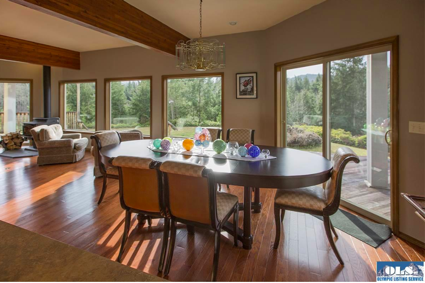 Look at more photos and learn more at: Sequim Beautiful Home. Buying a home out of town is something worth thinking about before you arrive in Sequim or Port Angeles or Port Townsend. How far out of town are you willing to live? What if your number one home is 15 minutes from downtown Sequim? 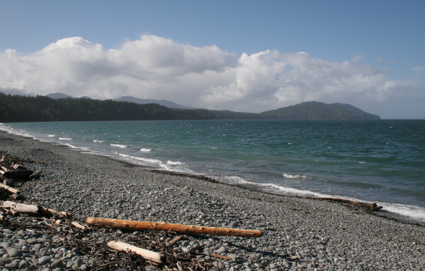 What if the home with a water view that stirs your soul is 15 minutes west of Port Angeles? What would you do? Convenience is an important consideration when it comes to buying a home out of town, and the further out you are, the longer the drive to the grocery store, Costco, Home Depot, WalMart, or the pharmacy. I realize I’m saying the obvious, but the reason it is worth thinking about is because some of the most incredible homes are further out on the concentric circles from our urban centers. Sometimes a home further from town is also on the side of a mountain or high enough to have an extraordinary water view of International waters. That can also mean a steep road or driveway. We don’t get snow very often, and we can go for years without any snow, but snow and ice can happen. This is a consideration for most buyers, but even Bell Hill in Sequim has some incredibly steep roads and driveways. There is an advantage for buyers who are willing to drive 15 or more minutes to town. Can you guess what that advantage is? If you’re thinking price, you are right. As you get further out of town, price goes down. It’s a matter of supply and demand. Buyers who want to be close to shopping have to pay more for homes in higher demand. Buying a home out of town means lower demand and lower prices. A gorgeous home right in town with a great water view that sells for $750,000 might sell for $625,000 just 18 minutes out of town. That’s a $125,000 difference. How far would you be willing to drive to save a lot of money? Maybe the only home you really love would mean buying a home out of town? It’s something worth thinking about. Buying a home out of town. This stock market volatility is scaring a lot of people, including fund managers. When the Dow is up and down over 400 points on consecutive days, it’s not a good sign for the weeks ahead. The Dow is down already 1,900 points in the first two weeks of 2016. Not a great start for the year. If you have a large retirement account invested in the stock market, riding a market roller coaster is a very uncomfortable feeling. This has already impacted how some people near retirement are thinking about the timing of buying their retirement home, and how much of a retirement home they can afford. If you look at the history of the stock market, substantial moves are often preceded by stock market volatility over a period of weeks, but even this is not a guaranteed indicator of a market decline. So what is a person to do in the uncertainty? 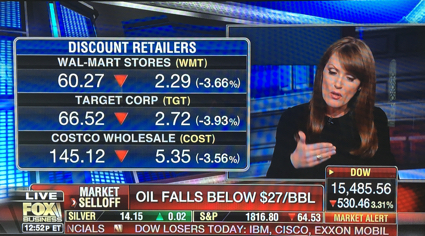 We are watching oil prices drop to surprising levels, and this has big implications for International markets. The reason Al Jazeera just went out of business in the U.S. a few days ago is because oil prices dropped, and the owner, which is the country of Qatari, cannot afford to subsidize Al Jazeera anymore. The drop in oil prices is causing middle east countries to liquidate sovereign wealth funds, and that means billions of dollars in selling on International markets. Add to that the declining China market, the struggling Japan economy, the unstable middle east, the grave uncertainty in the U.S. economy (and political scene), and people are understandably nervous. Here’s my pet peeve. In every market decline (if we have one, and I’m not saying we will), Registered Investment Advisers and Fund Managers all say the same thing, “Now is not a time to sell. We always tell our clients that they should invest for the long term. If you look at markets over a 50 year to 80 year time period, stocks go up. In fact, we are advising our clients to buy on the dips. Dollar cost averaging is the key to a long term strategy.” If you’re planning to retire in a couple of years, this kind of advise for the next 80 years is not reassuring. Many investment advisers have been saying in the past few days that they expect the market to decline “some more,” so many are admitting they see a decline coming. Despite this, why would they not recommend that you liquidate some of your account? If most advisers told their clients to liquidate some or all of their stock holdings, the markets would crash, and we can’t have that, can we? I suspect many investment brokerages prohibit their advisers from advising clients to liquidate, because of the market chaos that could create. Here’s the problem with that. You personally get sacrificed for the sake of the market as a whole! Even if your adviser believes it would be in your best interest to liquidate some or all of your account because he sees stock market volatility as a sign of a major decline coming, he will not tell you. So you are sacrificed for the sake of the many. In past market declines I have heard from people who watched their retirement accounts lose 30% or 50% or even 70% in one case. All the way down their advisers kept saying don’t sell. That’s easy for them, because fund managers get paid 1.25% of all funds under management, so they make money no matter what, as long as you don’t pull your money out of the market. Of course, selling would incur taxes and penalties for you, and that’s a big concern. But for all those clients who lost 50% of their retirement account in a market decline, how many would have gladly paid the taxes and penalties and still have been way ahead? Stock market volatility is a warning sign. Of what . . . remains to be seen, but it is a red flag, and ought to cause everyone who has a lot of money in the stock market to pause and seriously think about where their money is safe. I would be cautious about taking advise from a man or woman (or who has a fund manager) who makes money based on “funds under management.” They have no motivation to see you liquidate, and every motivation to see you stay in the market even if you lose your life’s savings. I agree with them when they say that you should not panic. On the other hand, if panic means saving you hundreds of thousands of dollars in a declining market, maybe a little panic thinking can motivate a person to do something that turns out right. Is liquidating some of your retirement account and investing it in a retirement home a good idea? I’ll leave that up to you, but this is a valid question for your perusal. At the least, stock market volatility should make you rethink what your adviser is telling you to do. Disclaimer: This is not a recommendation to either sell or buy stocks, bond, or any other investment. Talk to your expert for advise. While I was an attorney and Registered Investment Adviser at one time, I am not an adviser now, nor do I give investment advise. But stock market volatility of this kind can make anyone nervous. Doing your due diligence when you buy a home is extremely important, or you could end up with some big mistakes, like paying too much for a home, or discovering problems you should have discovered before you closed. I’ve written many articles on this real estate blog about due diligence on every aspect of buying. Here are some links to those articles. There are many issues you need to know about when you buy land or a home, but you are not likely to have your own checklists. I do. These are not checklists that other Realtors will be able to offer you (unless they copy my checklists), because I developed these due diligence checklists as a real estate attorney and Realtor over the past three decades. You should do your due diligence when you buy property, but I don’t expect you to become an expert by using these checklists. In fact, having a checklists is helpful, but you also must know how to use the checklists to do your due diligence properly. 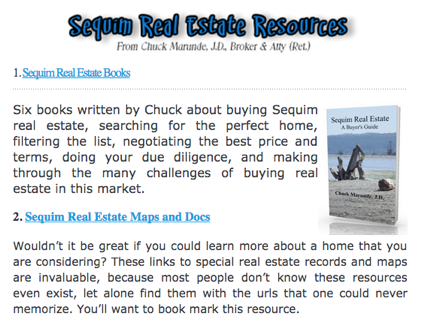 This last link will lead you to several powerful resources, including online maps and documents on Sequim properties, using an online MLS, Sequim real estate books for buyers, buying foreclosures, how to search real estate issues, and mobile apps for buyers. No real estate brokerage on the entire Olympic Peninsula offers so many free resources to buyers. Enjoy them, and if we can answer questions, simply email ChuckMarunde@gmail.com for any due diligence questions. There are several homes on the market that haven’t sold yet, even though they’ve been on the market for a very long time, i.e. years. That doesn’t always mean there is something wrong with them. It may be a unique and expensive home that is waiting for the right qualified buyer. But there are homes that do have a design or location or features that turn buyers off, and some sellers have given up and taken their homes off the market altogether. They did not buy a home they could sell. When building a home, one should also think about sellability. Perhaps a couple of examples will help make the point. I know a man who decided to build a fine custom home and sell it. It was his first home as a home builder. He wanted to build a custom quality home that would be impressive and beautiful. So he built a three story luxury home with the garage on the first level. The stairs to the second floor led to the kitchen and living room, and the master bedroom was on the third floor. The laundry room was on the first level, and there was no elevator. The home was initially priced above $600,000. No buyer wanted it. Can you imagine carrying laundry from the third floor down the stairs to the first floor and then back up? And groceries had to be carried up the stairs from the garage to the kitchen. This gentleman had a home that could not be sold. Another couple built a home that was designed for the wife, who had hip problems. She wanted to be able to take no more than one step to reach the opposite counter in the kitchen. The result was a very narrow galley kitchen no one wanted years later when they needed to sell. But there are many other examples. Weird floor plans and driveways so steep you are afraid to use them once. And generally people don’t move to a rural area like Sequim because they always wanted a modern contemporary home. Good luck selling one of those. Whether a person decides to build a home or buy a home, it is really important, especially when you are old, to be able to sell your home to another younger buyer. When you are ready to buy a home, always think about selling that home. Buy a home you can sell. Would you like a Buyer’s Checklist for buying your Sequim home? You may already know that this Sequim real estate blog answers the questions that buyers have been asking for 20 years, and with all the questions that buyers ask, it finally hit me that some of the questions buyers ask could be compiled into one sweet concise Buyer’s Checklist. You can download this 12-Point Buyer’s Checklist and print it out for your own use. This Buyer’s Checklist will definitely help you organize your home search and the entire process of buying a home. Another way of saying this is that it will help eliminate chaos and confusion in the process for you and for everyone assisting you. 1. The very first step is deciding where you want to live. For most people this is a matter of starting with the region or state, then drilling down to the county or city. Before you spend a lot of time looking at homes, first determine if Sequim is for you. Maybe you prefer Port Angeles or Port Townsend, or some other state, but if you don’t know where you want to live, this creates chaos for you and everyone trying to help you. 2. What kind of view would you prefer from your living room or dining room windows? Water, mountains, fields, valleys, trees? This 12-Point Buyer’s Checklist includes important items that every buyer will want to consider. Just being better organized in how you search for your home will save stress and time. Ultimately, this list could also end up saving money when you purchase your home. If you have any questions about any of the items on this checklist, don’t hesitate to email or call. I’m here to help you gather information, refine your home search, save your favorites (your short list for viewing when you come), and to make your time in Sequim and Port Angeles enjoyable and fruitful. 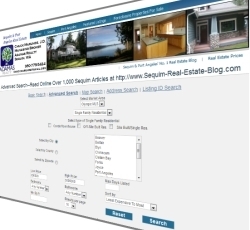 Download your Sequim Buyer’s Checklist now. There are many older homes built in the ’60’s, ’70’s and ’80’s that have nice traditional floor plans all on one level, but desperately need updating to compete with buyer preferences today. Many of these homes look so outdated and need so much work, they haven’t been viable options for many buyers who prefer “move-in ready,” or at least not major work. Unfortunately, many of these older homes that have not appealed to retirees happen to be on incredible lots with wonderful water views or mountain views. 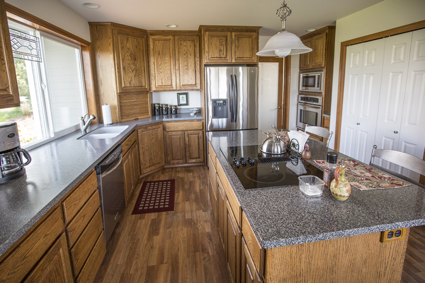 Fortunately for buyers, remodeling homes in Sequim is making a small comeback. Homes like this one in the photo are coming back to life, and at the right price are very attractive. A word of caution is apropos here. If an investor buys and remodels a home, but he cuts corners and doesn’t do a good job on the construction behind the walls and in the attic and in the crawl space, and if he uses cheap materials, the home may look good, but it may have problems. 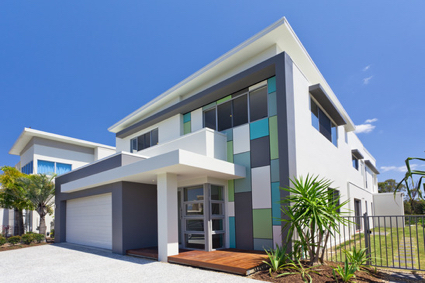 You could overpay for a home that looks good on the surface. The home in this photo is getting a quality remodel, and it will be gorgeous when it is complete. It will be priced around $245,000. 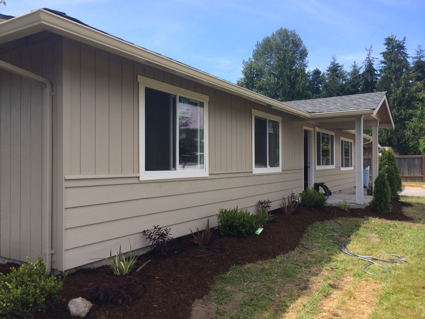 Remodeling homes is making a small comeback in Sequim, and this could open up new opportunities for the discerning buyer. This article is about how to find a home, or how not to find a home. 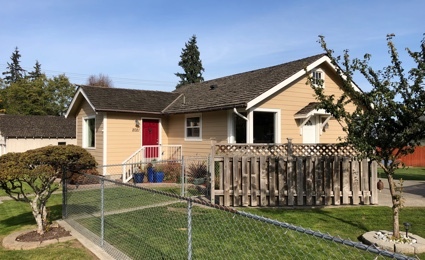 If you are a buyer scouring Internet sites to look at homes in Sequim, and if you are smart and doing your due diligence on values and other data available on a home, let me share some inside Sequim information that can save you a lot of time. More importantly, I want to save you from using sites with grossly insufficient data. Elsewhere on this blog, I write about how to find a home, what free sites to use, what free software to use, how to find accurate information on a Sequim home, how to determine fair market value, how to compare prices, and I share key links to help you. Is Sequim the Safest Place to Live? Why Retire in Sequim Washington? Is There A Risk Of Cliff Erosion or Coastal Erosion in Sequim? The closing date of your purchase is the date you will will own your new home. The statutory warranty deed is recorded, and if you get a loan, the deed of trust is recorded. Finally, after months of searching, after a couple of years of planning your retirement and your move, after listing and selling your other home, you will get to move into your Sequim home on the closing date. Planning the closing date takes some diligence to coordinate your transition, but there is a contractual aspect of handling the closing date that is important if you are to have a smooth closing and transition. That’s what I want to share in this article. When you draft an offer with your buyer’s agent, you will include the closing date that works best for you. Coordinating the sale or closing of your other home, hiring movers and making the transition is no small challenge. When your buyer’s agent submits your offer, you can only hope that your preferred closing date will also work for the seller. The seller also has to plan a move, and maybe the seller is buying another home, too. But once you’ve both agreed on a closing date, here’s a potential issue that could create a lot of stress for a lot of people–changing the closing date. From a buyer’s perspective, changing the closing date because of a change of plans does not sound complicated. But the seller will have to reschedule their own purchase of another home, the hiring their movers, and coordinating all the other details associated with their move. A change in a closing date requires an addendum signed by the buyer and seller, but it also means the lender and the escrow company will have to make adjustments and redraft their own paperwork. Many dates associated with a closing (the inspections and other due diligence items) are all tied to the date of mutual acceptance. Changing a closing date will have a ripple effect on a number of key dates, and it will require the coordination of many parties involved in your transaction. If the seller is buying another home, a change in their closing date with you might necessitate a change in the closing date of that other transaction, which involves all of those parties. Changing the closing date is not something that should be done lightly, and if at all possible, it should be left alone once you have mutual acceptance. When you buy a home, you vest title based on the names you put on the purchase and sale agreement. This means that once you close the purchase, the real estate records will show your names according to your preference. But here’s the question, does it make any difference how you vest title? Oh yes, it certainly does. Washington state is a community property state. That means that if you buy a home here as husband and wife, i.e. “John and Mary Doe, husband and wife,” you will own it together, and the survivor of the two will own the property entirely. In other words, this is the same as owning property “as joint tenants with the right of survivorship.” Whoever survives gets the property. This is how most married couples purchase their property, and you can vest title the same way even if you are not married. But are there other ways to vest title? If you are going to get a loan to purchase your home in Sequim, you will have to purchase (vest title) in your personal names, because the lender will require that, but subsequent to closing, you can execute a quit claim deed and transfer the home into your trust. Lastly, you might find value in knowing what the two biggest mistakes retirees make on this subject of how to vest title. The first is not to do any estate planning at all. In the typical scenario, a couple retire to Sequim in their 50’s or 60’s, and 20 plus years later the husband passes away leaving his widow to fend for herself with no estate planning, poor financial planning for his widow, and a home that cannot easily be sold but is way to much maintenance for an elderly widow. This happens all the time in Sequim, and it is totally preventable. The second mistake commonly made is to marry a second time later in life and not have any estate planning in place. That normally means the adult children from the first marriage will get nothing, and the new spouse who came late in life and may have been married only a few years, will get everything to the exclusion of all the children. That is not usually what people would intend to do. But with no estate planning at all, and depending on how you vest title to your real estate, it can and does happen. As your Realtor and buyer’s agent, I can advise you on how to cross your T’s and dot your I’s when you buy and vest title. Is there a secret to buying a home? I think there is. It’s something that I have been observing in buyers for over three decades, and I realized that the conversations that I have been having with hundreds of buyers have included a very important element. I’m not suggesting there is only one secret or a single key or magic wand that will answer all your questions about which home to buy. Life is not that simple, and neither is buying real estate, but there is one thing that can give you the experience of hundreds of buyers just like you, and I thought I would share that today. I’m assuming that you’ve searched online and looked at many homes and as you searched, you narrowed your search parameters so you would get a better list of potential homes based on your personal preferences. You should narrow the list to a short list of 6 to 12 homes. Once you have your short list of homes to view, how do you filter and sort those mentally and emotionally so you can narrow that down to “The One?” I think you’ll find this to be a valid secret to buying a home. The home buying process can be confusing if you haven’t bought several homes, and even if you have, the home buying process will vary in different parts of the country. In the Sequim and Port Angeles area, we have issues of concern that are unique to our area. This real estate blog has hundreds of articles explaining the home buying process from A to Z, but I thought it might be helpful to have a short summary of the basic process for buyers. Your agent will help you address the many challenges that will come up while your transaction is pending. Some can kill a transaction, and this list alone can be quite long, but an experienced agent will help you resolve even the most complex scenarios. Frankly, not all buyer’s agents actually do all these things for buyers. In fact, few agents do all of these well for buyers. Many agents tell their clients some of these are not their responsibility. So step number 2 is kind of important, isn’t it? You can read more about each of these steps by simply reading the many articles on this real estate blog (search by phrases), but now you know all about the home buying process in Sequim and Port Angeles. Buying a home from a bankruptcy trustee is complicated. If a homeowner files bankruptcy, all assets owned by the homeowner are controlled by the bankruptcy trustee, and a home cannot be sold without the trustee’s approval. The homeowner looses control of selling the home and the process of selling the home once he files for bankruptcy. The process of buying a home from a bankruptcy trustee is governed by Federal law, and the whole process is defined by the trustee, not by the homeowner and the buyer. Sequim roofing repairs are often needed when buying a home, but buyers face a potential dilemma on this issue. Once you and the seller are done negotiating the price, and you have a firm contract (mutual acceptance), you’ll want to hire a home inspector during your due diligence period. What if the roof needs to be replaced at a cost of $14,000? Who will pay for that–you as the buyer or the seller? A home inspector cannot tell you if the roof needs repair. His liability insurance carrier prohibits him from making specific recommendations or drawing ultimate conclusions about things like roofing, the foundation, the heating system, and so on. So if he thinks the roof might need repair or replacement, he will recommend you bring in a roofing contractor to tell you. Here’s the challenge. There are roofing contractors who will tell you the roof needs to be totally replaced even if the roof has many years left. They make their living replacing roofs, not giving free advise. But this kind of advice can literally kill your real estate transaction, because if you as a buyer present an estimate for a Sequim roofing job in the amount of $18,000 to the seller and ask him to reduce the price or give you a credit, the seller is likely to freak. In this market the seller may have already reduced his price a couple of times over the past year, and then he agreed to a further reduction in the negotiations with you, so he already feels he is below what he is entitled to. He may be wrong, of course, but the point is he is not going to buy you a new roof at this late stage in the negotiations. But what if the roof really did not need to be replaced? An honest professional opinion on a Sequim roofing job is absolutely critical to the successful negotiation of your purchase. If the roof really has 10 years of life left, you don’t need to get into a knock-down-and-drag-out fight with the seller and risk losing the home. If the roof has 5 years left, perhaps you just replace it in 5 years, because you already negotiated a very good price on the home. 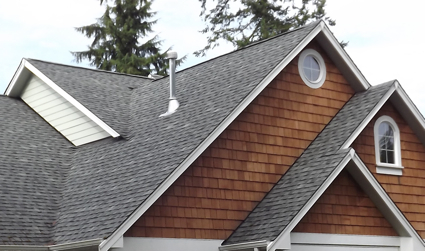 I’ve personally interviewed a number of Sequim roofing contractors and I know their work. When I act as a buyer’s agent, I help my clients work through any Sequim roofing issues, and when appropriate, we can negotiate a partial reduction in the price. But that is a delicate issue with a seller, and it takes some negotiating finesse to resolve serious Sequim roofing issues. When Do I Make An Offer on a Home? When should you make an offer on a home? If you have seen a home and you would love to own it, but you are struggling with the timing of when to make the offer, or you are struggling with the listing price, which you feel is too high, you need to know how to approach this issue or you could lose the property to a buyer with a more experience buyer’s agent. The property in the photo below just sold for $250,000 after being listed in the MLS for $399,000 for a long time. Contingencies are an important part of buying a home in Sequim or Port Angeles. In fact, once you arrive at mutual acceptance on the price, that just completes the first phase of your negotiations. Completing a home inspection, a septic inspection, a well inspection, and perhaps follow-up inspections will lead to the second phase of negotiations if there are items to be repaired or if major problems are discovered that were not previously revealed. How you handle inspections and negotiate with the seller in this second phase could make or break your deal. It is critical for your own protection as a buyer that the language used to describe the contingencies (and the request for repairs or a credit) be articulated without ambiguities. The last thing you need is to get into a legal dispute over what was intended, and if you leave any ambiguities, you could lose your transaction in a dispute. Notice how clean and concise and without ambiguities the language is in this Notice to the Seller. There must be only one way to interpret every single sentence, so there will be absolutely no possibility that there could be a misinterpretation. This language does exactly that. Attached as Exhibit 1 is a copy of the Home Inspection Report. Attached as Exhibit 2 is a list of the issues of primary concern to Buyers. Attached as Exhibits 3 and 4 are two bids for window replacement in the Sun Room. Attached as Exhibits 5 and 6 are the well report and the estimate to replace the well pump and repair the water softener. Buyers request that Seller address all items on Exhibit 2 to Buyer’s satisfaction, or in the alternative that Seller credit Buyers $3,000 at closing, which is less than the actual repair costs of all items in the Inspection Reports. Contingencies can finalize your home purchase and bless you with a pleasant and exciting experience you will remember for the rest of your life. But if not handled correctly with great attention to detail and with the experience to draft legal clauses with precision, you could end up in trouble or find out after closing that you have some huge repair bills you did not anticipate. Handling contingencies is just as important as reaching mutual acceptance on the price in the first place. You might be searching flights to Sequim if you plan to come and look at homes. I’ll tell you what many retirees ask me. They ask, “Do I have plenty of time? We’ve narrowed our list of prospective homes down to about half a dozen from your Sequim MLS site, and there’s one in particular that really looks perfect. And it’s in our price range. We’re planning a trip to Sequim next month. Do we have enough time, or should we look for flights to Sequim right away? Do you think that one house will sell before we get there?” It’s a legitimate question because flights to Sequim are not cheap on short notice. The answer to the question is that the perfect home might sell tomorrow, next week, or next year. I do recommend reading my article about how the best homes in Sequim in the best areas at the best prices are selling as though they are in a normal market, not a recession, or you can watch the video on Sequim’s Real Estate Market is Bifurcated. If money is no option, then the cost of flights to Sequim on short notice will not be a factor, but for most of us, the cost is a factor. 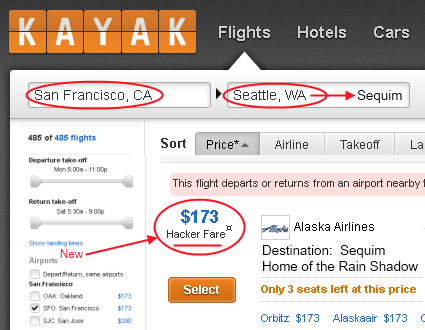 If you want to come to Sequim asap, check out Kayak.com and their “Hacker Fare.” Sometimes you can get a flight to SeaTac from cities around the U.S. at an incredibly low rate based on their “Hacker Fare.” This is two one-way tickets at discounted rates, which sometimes is less than a round trip fare on short notice. This site is a great site to search flights to Sequim.